I promised a grand time with great art today—and we’re getting it! Remember this teaser from mid-January? Yes, this is Lash, also known as the Rogue of the Rose! Ah, that grace and elegance… Like a rose with its thorns, but on a higher scale, Lash is a beautiful but deadly ninja. She wanders the wilderness always training to become stronger, acting largely of her own accord, and any confrontation with her reveals her to be a cool customer with a great poker face and a calm and collected demeanor to match. And shown above is her entrance animation! When she first appears on a battlefield, time seems to come to a halt as the breeze heralds her arrival. She can even fight with projectile weapons, as you might have guessed based on her dialogue portraits! 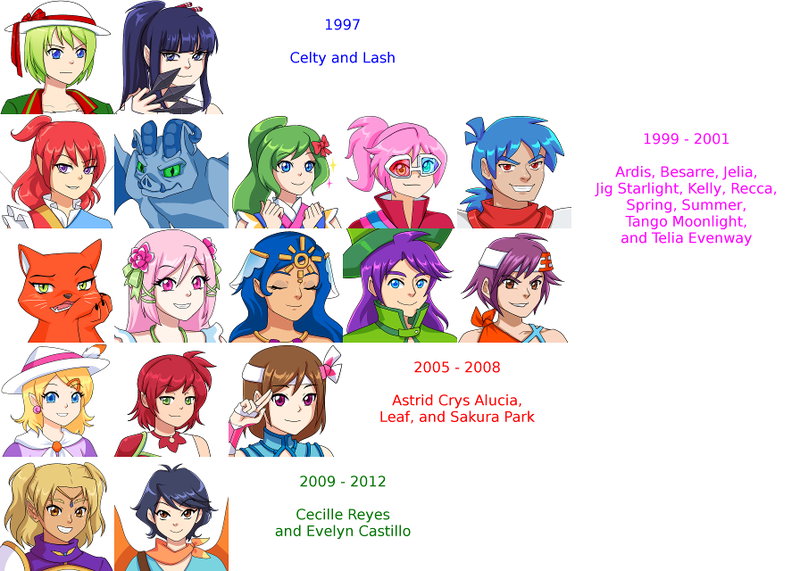 Even though some of these portraits have been improved upon since they were first drawn, the dates when my characters were made are what they are—so I wanted Lash to stand out compared to other sprites! Most enemy sprites only have one animation, but the idea of giving Lash her own entrance and the usual idle and multiple visible weapon types definitely helps make her distinct. By the way, even though the style of sprite that I have Liz drawing is obviously used for enemies, don’t read too much into that story-wise as far as who Lash is; I think you’ll be surprised which characters (and how many characters?) pictured above will eventually have enemy sprites. If I thought it was a big spoiler, then I would have kept her hidden like the two mystery monsters I linked above. Before we go, I just wanted to comment that those of you familiar with the Super Smash Bros. series might find it a bit unfortunate that Lash can hold weapons, but doesn’t visibly attack with any of them—you know, like Ganondorf having a sword in his taunt but not using it in battle. Well, Lash is one of my long-time favorites, so I saw fit to correct that and commission even more for her! This took a lot of work to figure out, by the way; one of the most underrated game developer skills might be getting the timing of animations to feel right. Even now I’m still not convinced it’s the best it could be! Liz can make super great art, but it’s up to me to use it well. Throughout several versions of her animation, you can get a sense for how I had been trying to make it feel fast enough to convey her ninja speed while not so fast that it was incomprehensible. Speeding up every fame, slowing down every frame, making her slash significantly faster than everything else, making her slash “hang” for more of a “bullet time” Matrix feel… there were many routes to go. Of course, before I even commissioned this animation, I had already commissioned another earlier one to convey Lash’s speed! I hope you find all of these sprites as great as I do! And, hey, if you do, post a comment or let Liz herself know. =) Some ways to reach her are listed on the Team page, after all! There’s actually still more to be drawn with Lash sprites considering that she can use magic, that we haven’t done animations for her other weapons, that she can fight by [redacted], and finally, just like [redacted], she’s capable of [redacted] when she cuts [redacted]! But those will have to wait for another time to be created since I can only cover so many expenses at this specific moment. Speaking of waiting for another time, these sprites for Lash might represent the final art we see from Liz prior to the Kickstarter—many things are up in the air right now, including me hunting for another source of income (since I don’t intend for the Kickstarter to completely cover living expenses and paying for assets), Flora drawing something special that you’ll see soon, the grid battle system for ORK finally getting funded (this is the one I had wanted since the end of November), and even the ORK creator himself blindsiding all of us in the best possible way this past week by introducing multiple actions per turn into his framework, which I’ve been wanting for ages. Honestly, just on that last point alone I could probably write another 3500 words about things I intend to do, never mind the other stuff that I also want to write about, but it’s 11:53 PM and I want to actually have this post out on the day that’s written in the title. :P And I have to save something for next week! In any case, my point is that I don’t completely know where I’ll be putting time and money over the next few weeks and I especially don’t know where I’ll be earning money over the next few weeks, so pixel art from Liz may be on hold for a bit just as it’s been with Becca for about half a year. And so with that I say thank you to her for everything she’s done, which has all been just fantastic, and we’ll meet again when that time comes—hopefully sooner than later! This entry was posted in Devlogs, Dreamblazers on February 2, 2016 by JellyPaladin.